In the travel brochures, your prospective destination always looks perfect: the sun is shining, the sky is clear, perhaps there’s a puffy cloud or two on the horizon. That’s because visitors’ bureaus are smart enough not to publish photos of, say, Paris in a driving rainstorm, or Yellowstone the day after a forest fire. When you make your travel plans, though, there’s no guarantee that you’ll arrive on a day that has those ideal conditions you had allowed yourself to expect. Of course, the unexpected is one of the reasons you travel. 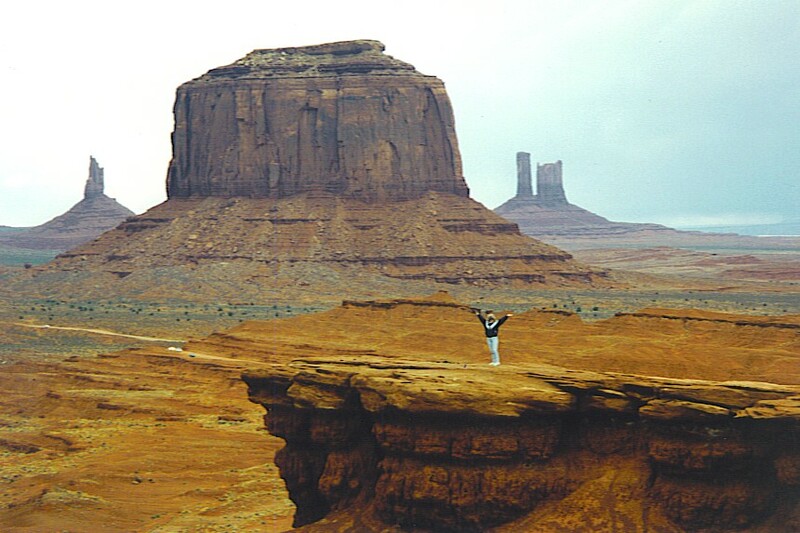 Monument Valley is operated as a Navajo Tribal Park. There is a Visitor’s Center, which charges $2.50 per person. On the grounds surrounding the Visitor’s Center are many tour operators eking out a living. We looked around briefly, then headed for Goulding’s Lodge and Trading Post. Somewhat surprisingly, our room was ready when we presented ourselves at about 12:25 p.m. We inquired about the tours which Goulding’s operates. Sally had mentioned that this was our wedding anniversary — the desk clerk recommended the sunset tour as being “very romantic”. We had lunch in the dining room — soup and salad bar. As we came out, skies were darkening, and not long afterward, a little rain fell. On the horizon, there were flashes of lightning. From a photographic standpoint, the monuments were getting less and less picturesque. The tour was to depart at 4:00, and even though the sky wasn’t promising, we decided to go for it. After all, it would be romantic, even if our pictures weren’t great. (Incidentally, the 3½ hour tour was $30 per person.) Eight of us — and two more joined us later — piled into the back of a converted pickup truck. There was a framework which supported isinglass flaps. The side on which we chose to sit had the flap rolled up, so at least our view wasn’t obscured. The scenery is dramatic, all the more so for the threatening clouds. Our driver and guide was a Navajo woman named Carol. We set off into the valley on deeply-rutted dirt roads. There was a cold wind blowing across the desert, which coated all of us with a layer of red dust. We were jostled by the ride to the extent that one of our fellow passengers compared it to white-water rafting. The truck threw us around violently as it lurched along the dirt track, we were cold, we were dirty, our teeth got gritty from the dust. So what else could we do? We laughed. That day was our 29th wedding anniversary. On April 25th this year, we celebrate our 40th. Among other things, that number represents a lot of romance, much of it expressed through laughter.